Watch this Video for proper mixing tips. Hair Help is just a step away with our famous recipes. 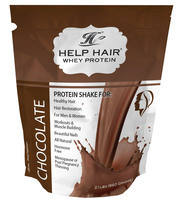 Help Hair Shake is a Protein Shake for Hair Loss. Proper mixing of the Shake and daily use will give maximum results. See list of Recipes and frequently asked mixing questions below. To see faster regrowth go to the bottom of the page. Douglas S. with some handy mixing tips! Our recipes are based on NCBI studies and actual patient feedback to get additional faster regrowth. 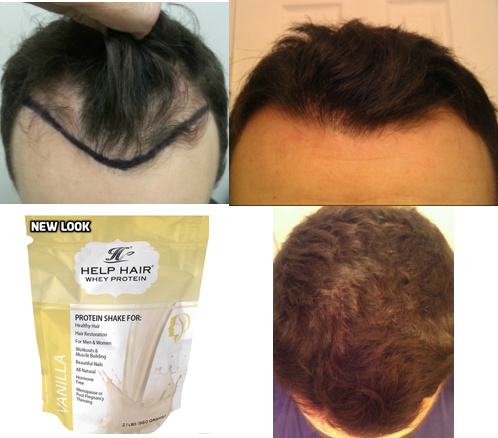 Typically we see full growth in as little as 5-6 months using just Help Hair® Shake after a hair transplant. We have seen even faster growth after a Hair Transplant in as little as 4 months adding one or two additional ingredients such as capscaicin or caffeine. But taste is a factor and we suggest that you try a recipe that you will use daily. These recipes can be used for thinning hair, periods of shedding when under stress, pre or post menopausal thinning or post pregancy telogen effluvium and male pattern baldness. #1 - Can I mix the shake with ice to chill it? #2- Can I heat the shake or microwave it? #3- How much water should I mix with the shake so it tastes good? #4- How many servings are in the shake pouch? How do I know how much to put in a glass for a single serving? #5- Do I need to refrigerate the shake? #6 Can I mix the shake with my current whey protein? #6 tip No. You will decrease the efficacy of Help Hair Shake. #7 Can I take more than 2 scoops a day of the Shake? #7 tip No- if you do you will become anabolic. #8 I want more protein with the shake. What can I do? #8 tip- Add peanut butter or yogurt or milk (additional 8gms protein per serving). #9 I am lactose intolerant and I think the shake may upset my stomach. 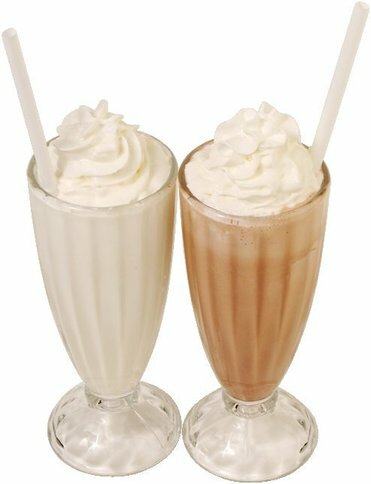 #9 tip - Mix the shake with juice and let it dissolve the lactose for an hour before drinking. And start slowly when using the shake. Start the first few days with half a scoop and work up to a full scoop. We suggest reading the Do's and Dont's Handout for more information. One of our most popular drinks! 1-2x per day Add some moderate exercise and shed the pounds too! Add 1 heaping scoop Help Hair® Shake with apple, bananas with crushed ice. Blend with ice and water or milk. Do not heat. A small amount of Caffeine has been shown to increase hair regrowth. 1/2-1 tsp of crushed chilipeppers. Add slowly to taste. Mix with 12-16 oz of water. If interested call for exact details. We call this Peppy's Spicy Mocha Help Hair® Shake. Be careful because not everyone can drink caffeine and chilipeppers. In fact ask your Help Hair clinic or healthcare professional if you can use this recipe. Caffeine and chilipeppers alone will not regrow hair without Help Hair® Shake. Free Offer: Share your success story and get Complimentary bottle of Help Hair® Vitamins. If you have used Help Hair® Shake and want to share your success story with before and after pictures that we can post online we will send you a free 60 tablet bottle of vitamins with your next purchase of shake.